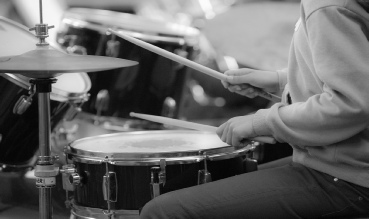 Most tuition in schools takes place on standard drum kit and pupils may start from year 3. It may be more appropriate for lessons to be taken as a pair or individually but if resources allow, small group lessons are offered. It is important that the pupil is able to practice between lessons either at home, school or other convenient location if progress is to be made. Nemco does not provide drum kits but practice pads and sticks may be purchased. School instruments are used during lessons. Pupils may wish to move to tuned percussion after learning kit for some time.